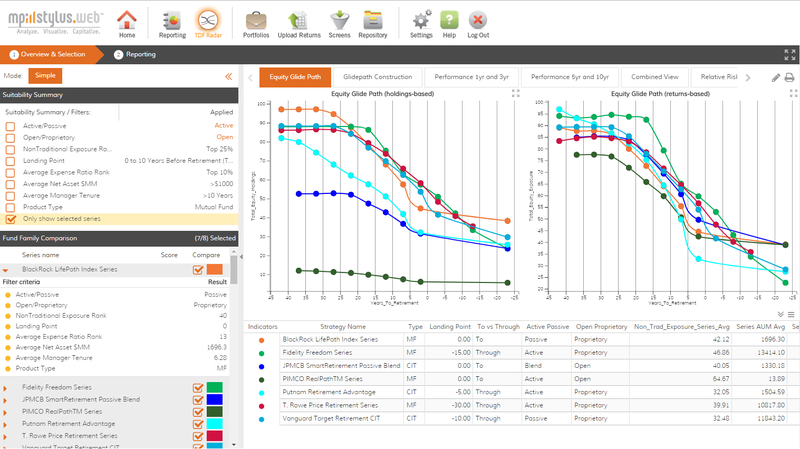 Our cloud-based target-date fund analytics and reporting platform delivers a powerful solution that helps defined contribution advisors meet client suitability and fiduciary obligations while also helping asset managers better understand and demonstrate how their products compare to the competition. Gather information on a plan’s objectives and participant demographics and behavior. Establish preferences across Target-Date Radar Suitability Criteria: Active vs. 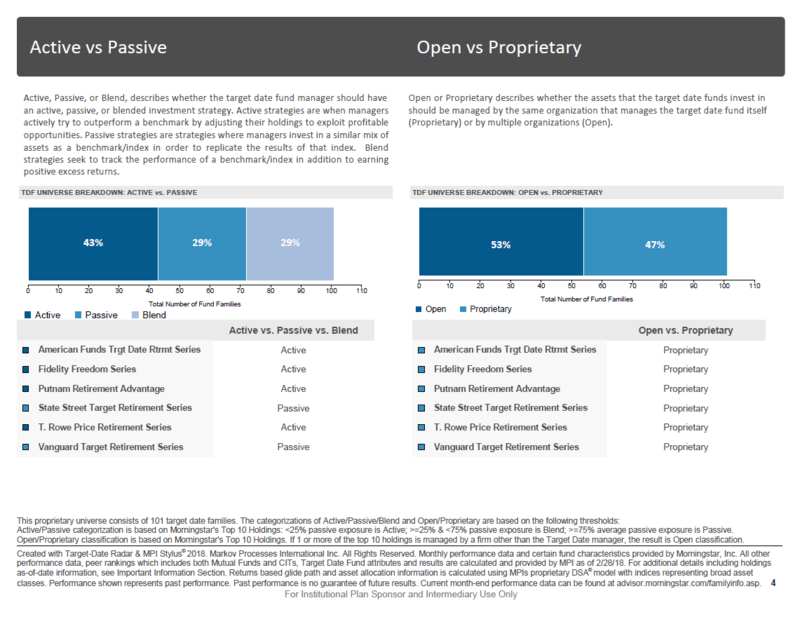 Passive Management, Open vs. Proprietary Architecture, Non traditional Assets, Landing Point (To vs. Through) and Glide Path Shape (LVI). Active managers try to outperform benchmark indices through numerous strategies, with mixed results. Passive managers cannot outperform benchmark indices but track them closely and at a much lower cost than active management. Some TDF providers only utilize proprietary funds as the building blocks of their TDF, trying to control risk exposures. Others try to select best-in-class funds as the building blocks, regardless of the fund company. 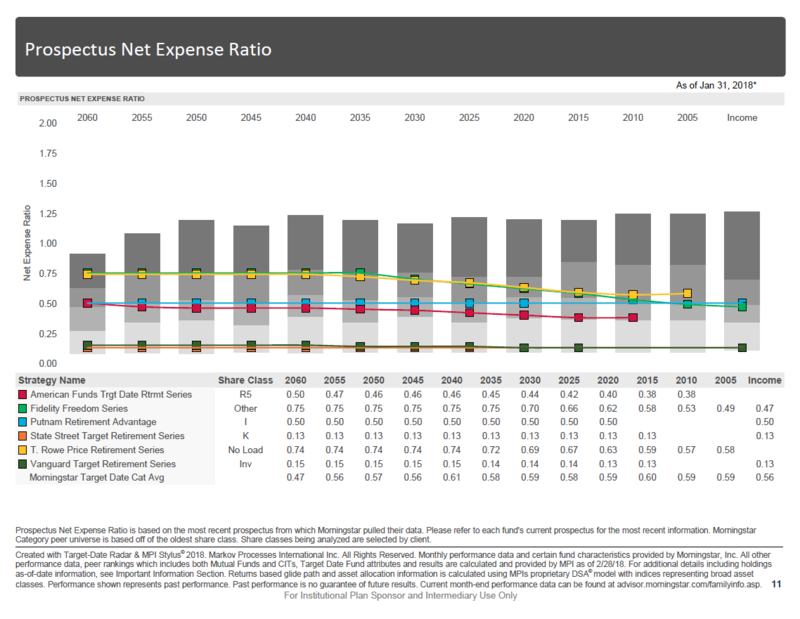 Some TDFs simplify their asset allocation by limiting assets to US equities, US bonds and Cash. Others use many different non-traditional asset classes from around the globe in an effort to reduce risk through diversification. 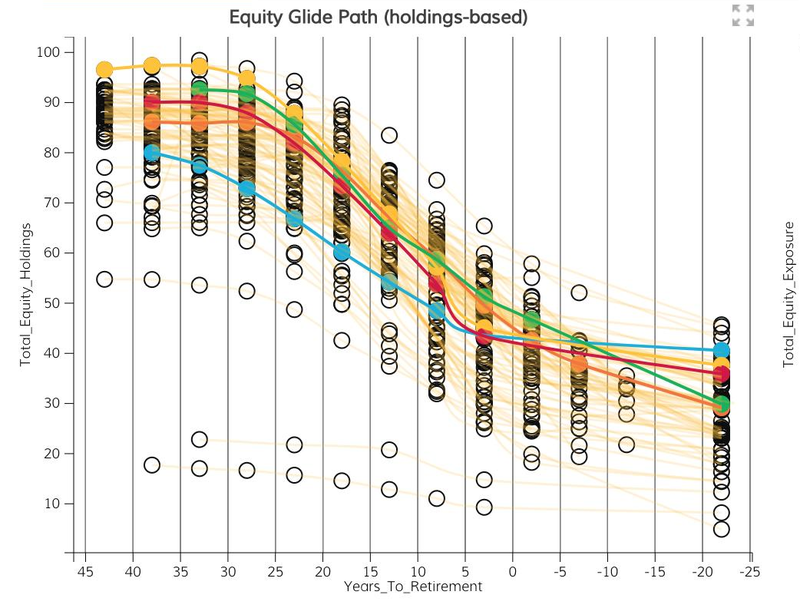 Some TDFs reach their minimum-risk allocation at (or before) age 65, while others continue to de-risk through retirement to as long as 30 years (age 95). The behavior of your participant base should drive this decision. 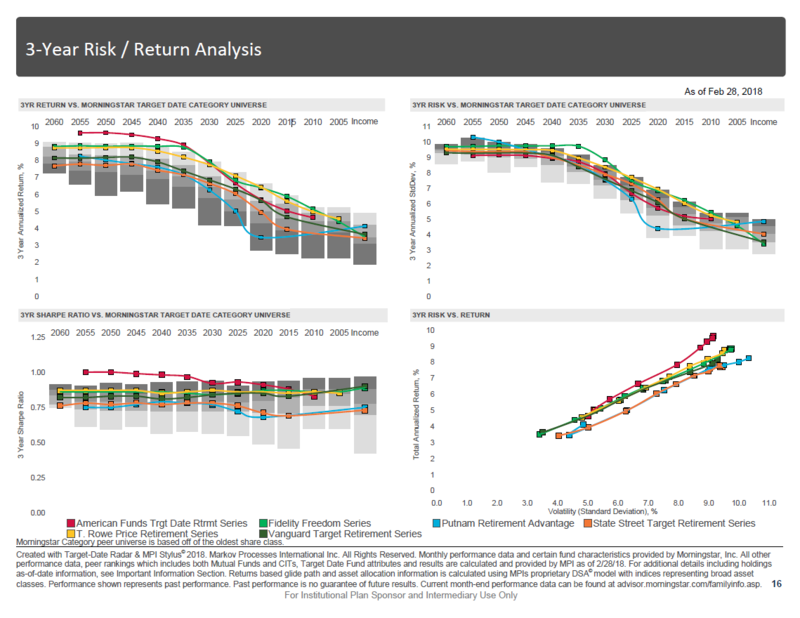 Each TDF addresses the 3 retirement risks in a different balance (Longevity, Volatility, Inflation). The optimal combination considers participant demographics and behaviors in addition to sponsor views and objectives. Generate a custom scoring system based on Suitability Criteria preferences. Interactively navigate the ranked universe of TDFs. Top scoring TDFs are presented in a visually intuitive format with an extensive range of charts and statistics for accurate decision-making. Generate current vs. proposed comparative reports. 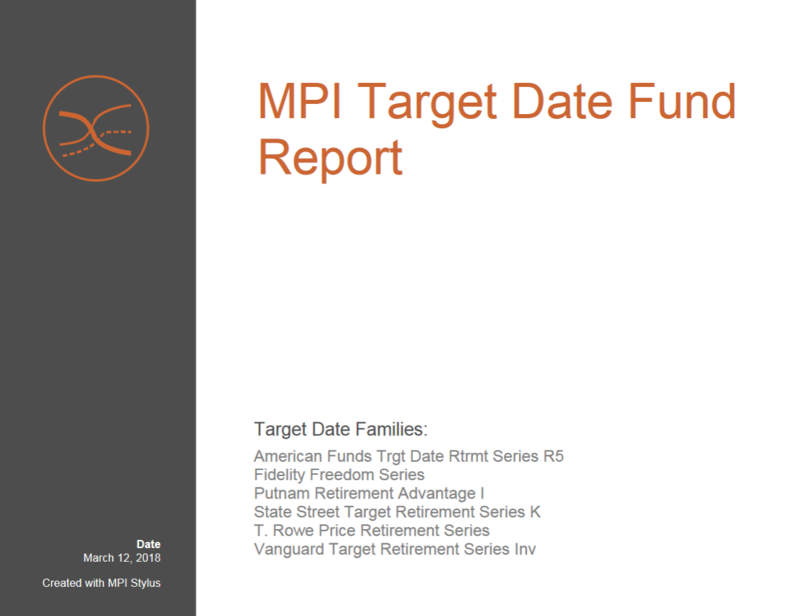 Fulfill Fiduciary Duty: With analytical rigor and a defined process, Target-Date Radar supports advisors and plans in upholding their fiduciary responsibilities. Go Beyond “To vs. Through”: Suitability Criteria moves past simple assumptions for evaluating, selecting and monitoring TDFs. 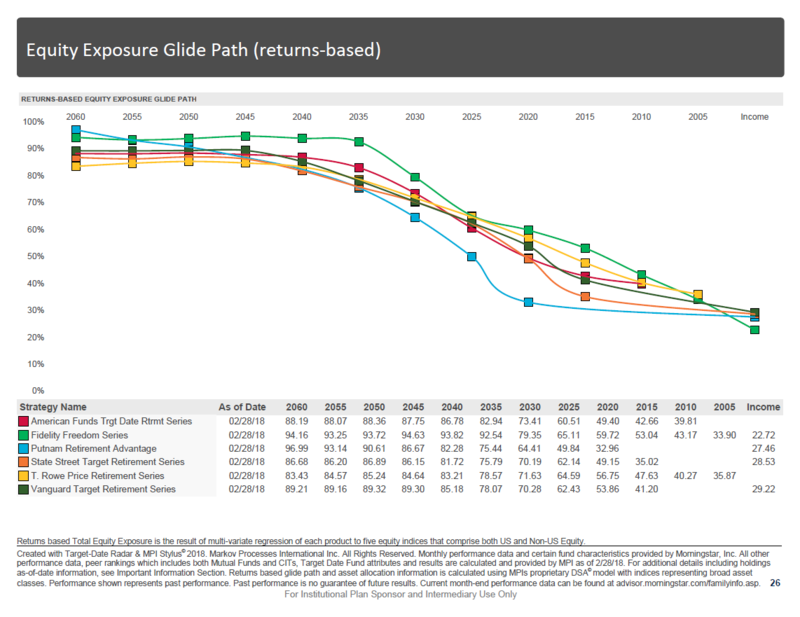 Comprehend Complexity: Better understand glide path shape, asset allocation mix and product construction. 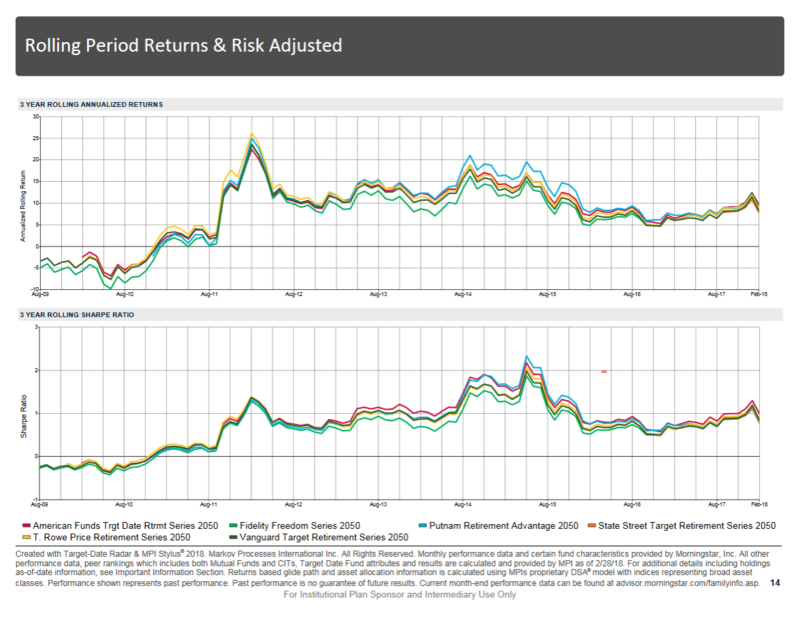 Robust analytics measure longevity, volatility and inflation (LVI) risks. Institutional Methodology: Built with input from leading institutional consultants acting as fiduciaries on large defined contribution (DC) plans. Conflict Free: Target-Date Radar is objective and impartial. 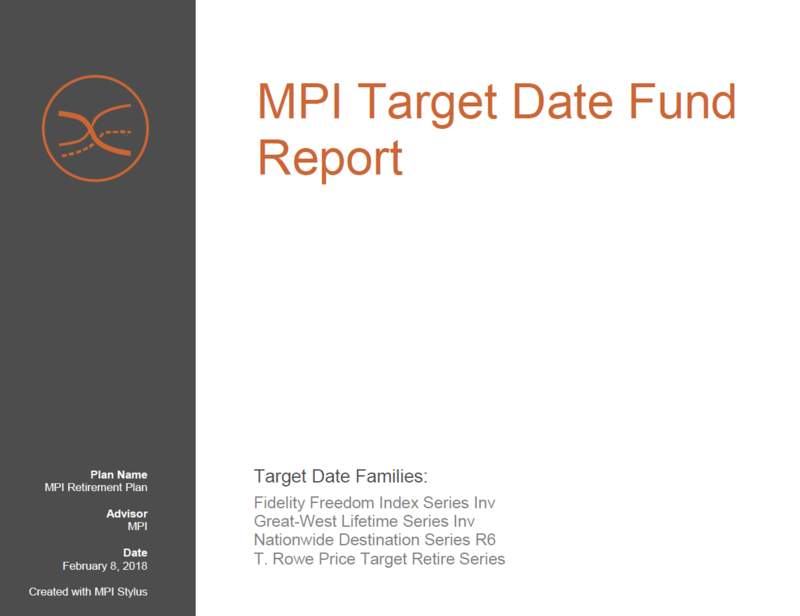 MPI is an independent investment technology firm, not an asset manager trying to promote its own products. Comparative Reports: Powerful reports compare TDFs against a backdrop of peers. Support the decision-making process and ongoing monitoring. 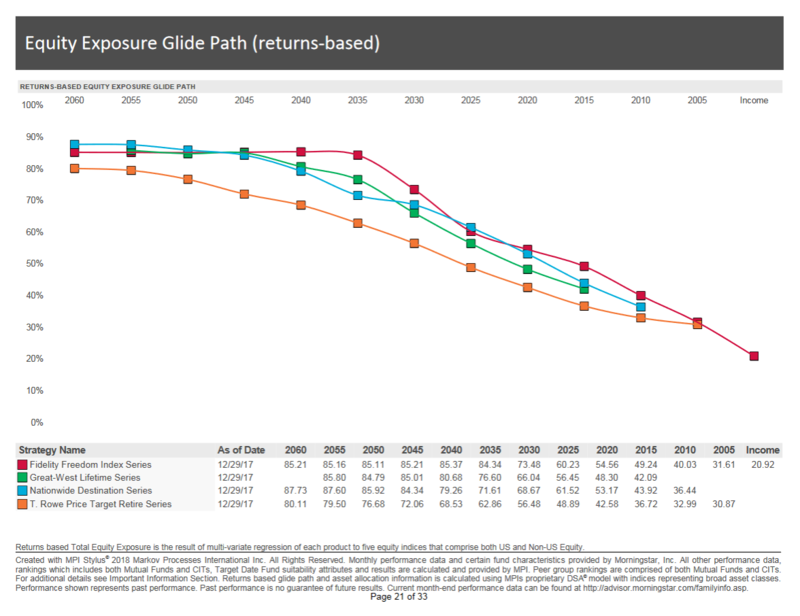 Comprehend Complexity: Better understand glide path shape, asset allocation mix and product construction. Delivering a comprehensive competitor analysis and flexible reporting solution to support the unique needs of TDF product and sales teams at asset management firms. See how your products stack up against other TDF families through an interactive, easy to use dashboard. Ability to compare quantitative and qualitative metrics at the vintage or family level for both mutual funds and collective investment trusts. Quickly generate powerful reports that highlight your products’ competitive strengths and address the unique demands of individual advisor clients and prospects. We can also customize our out-of-the-box report to meet your firm’s specific requirements. Comprehensive fund database: Includes mutual funds and collective investment trusts for more comprehensive coverage of the TDF universe. 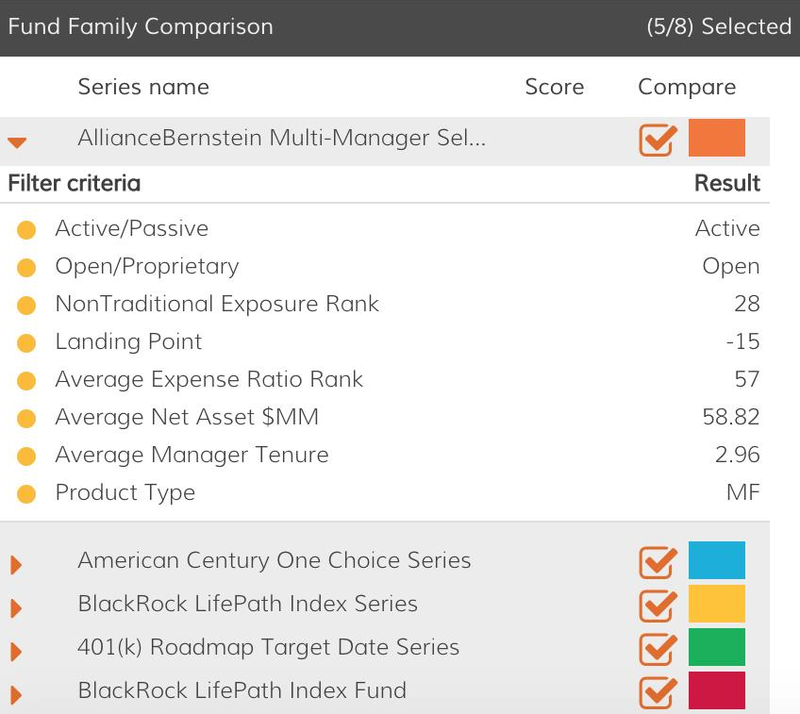 Seamless search and selection: Quickly and easily parse entire fund families and swap share classes for deeper competitive insights. Single-click reporting: Leverage the industry’s most advanced analytics out of the box with the option to customize to meet your firm’s specific need. 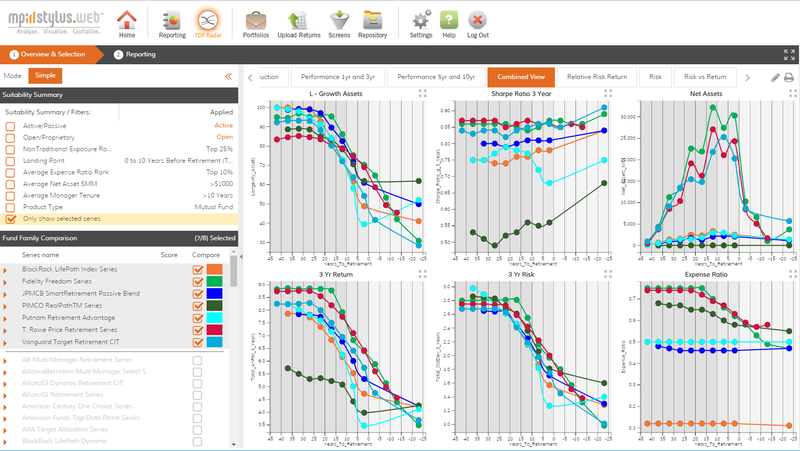 Better understand competitor products: Analyze and compare glide path shape, asset allocation mix and product construction. Improve sales support: Generate influential sales material that better positions your products against competitors using holdings-based and returns-based analysis. Create customized collateral: Build powerful comparison reports on the fly that address your prospect’s specific interests and needs. Compare your products using selection criteria a employed by end clients. Ability to customize your product reports to align with sales strategy and narrative.